Your Tbilisi guide and driver will meet you at 9 am at the lobby of your Hotel. 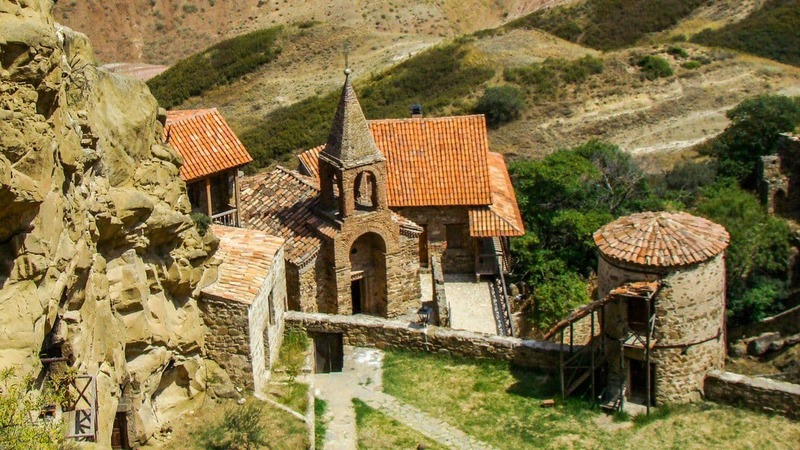 Although David Gareja monastery complex is only 60 kilometers away from Tbilisi. It takes almost 2 hours to get there. The picturesque road lies through the so-called Sagaredjo semi-desert. The complex itself consists of about 20 monasteries and quite a number of monk cells (small caves) cut inside the Udabno mountain. The oldest of the monasteries was established there by one of the “13 Assyrian fathers”, Monk David. The monastery has his name ever since – “David’s Laurel”. The David Gareja monastery complex still houses number of ancient frescoes from VIII-XIV centuries with many religious and historical figures depicted on them, like one of Georgian Queen Tamar for instance. In order to get to the monk cells on the other side of the Complex you will need to walk up the rather steep hill (about 30 minutes one way). David Gareja monastery complex is located on the border between Georgia and Azerbaijan.